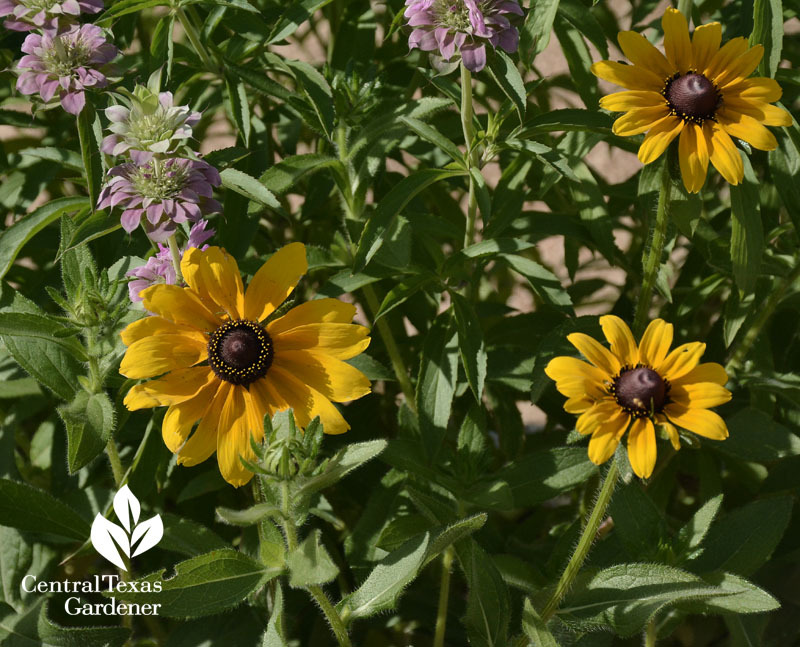 Rudbeckia and beebalm (bee balm): What a pleasing combination for us and the wildlife. Even better, this cheery team was planted by the children at Oak Hill Elementary! 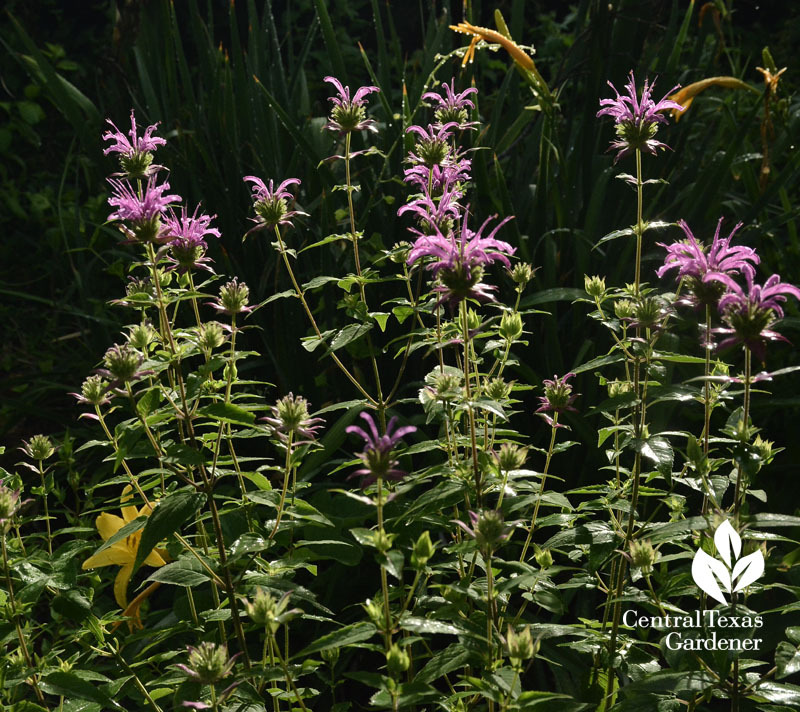 At home, my Peter’s Purple beebalm finally settled in after Daphne shared a division a few years ago while trialing it. 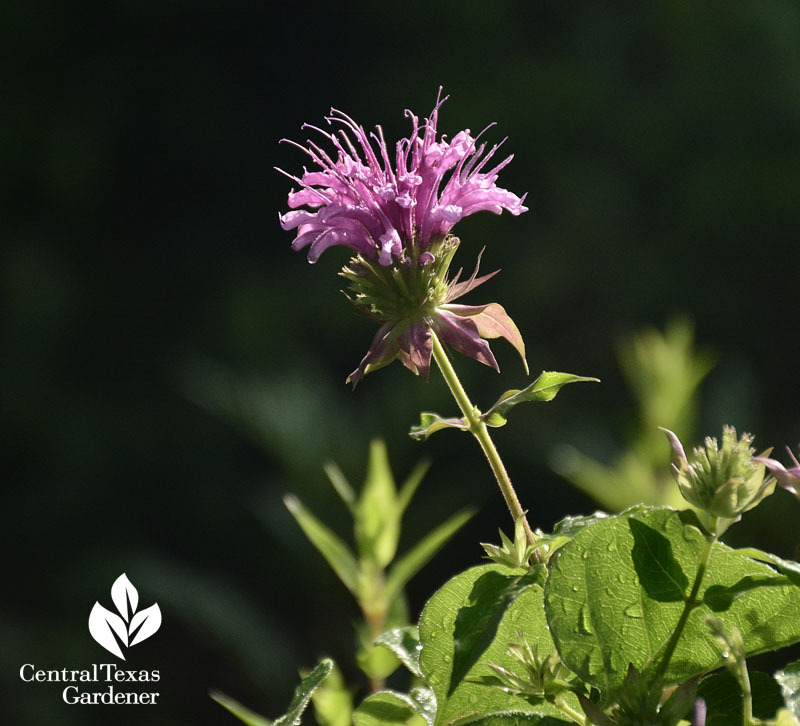 Back in 2007, Jimmy Turner, then at the Dallas Arboretum, told CTG about his success with this mildew-resistant Monarda, a cross between American and Mexican varieties. Eventually, it made it into the market as a confirmed hit. Mine’s already spreading, which is fine by me in this spot that gets morning sun and gentle afternoon light. And when it goes nuts, I’ll pass it along! Until then, bees and hummingbirds will go nuts. I already spotted my first hummingbird on it! 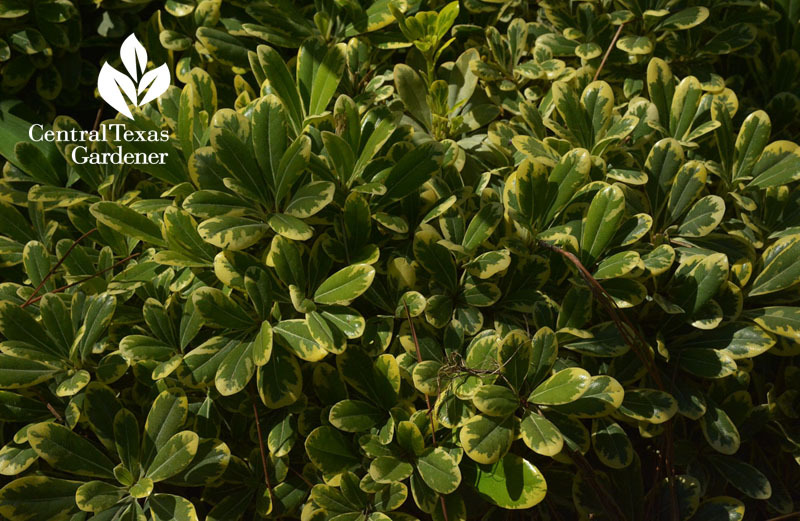 For semi-shady spots, Daphne makes evergreen dwarf pittosporum Plant of the Week. She’s growing ‘Mojo’ against her patio, where Augie’s sniffing in case a cookie fell in. 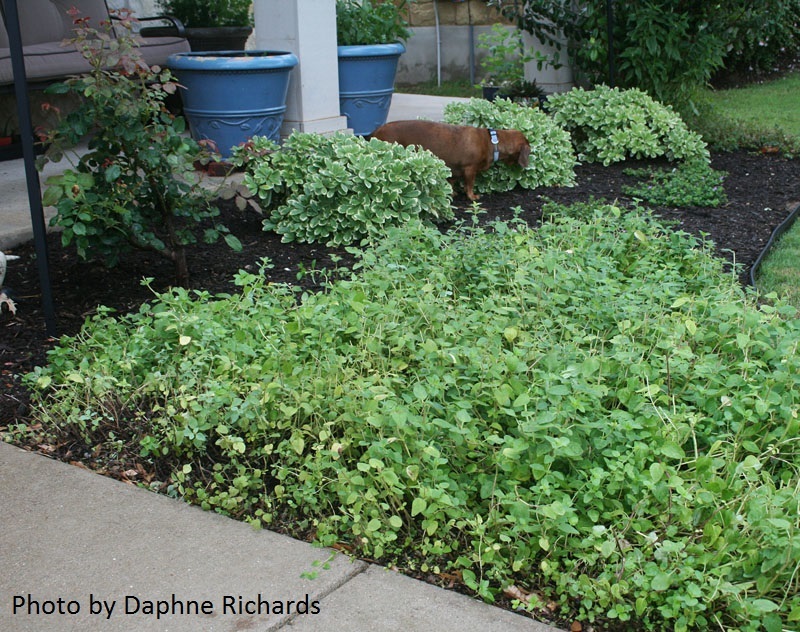 Oregano’s in front. Another you’ll find is Cream De Mint™ Dwarf Mock Orange (Pittosporum tobira ‘Shima’). 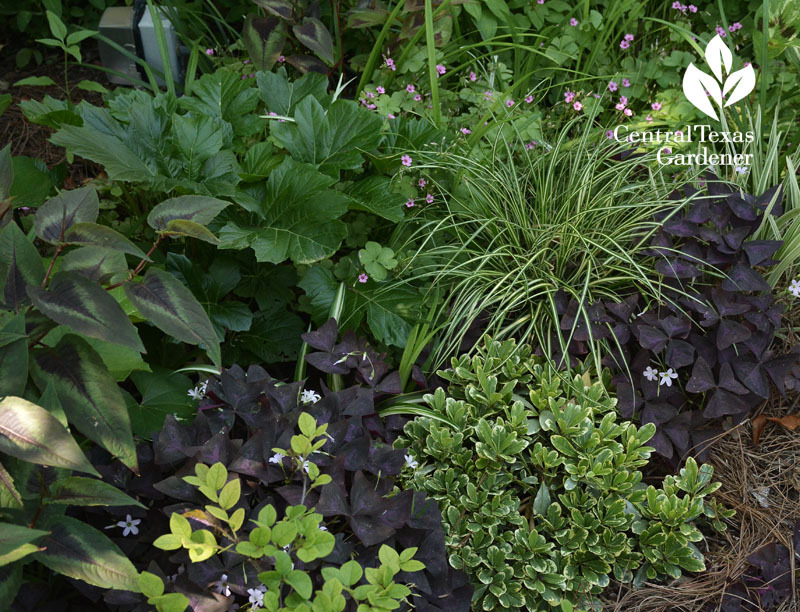 There are others, too, that offer a tidy roundness to strengthen a multi-textured bed. Since it’s cold hardy to Zone 7, it’ll hang with you if its companions go underground in winter. Daphne reports that it’s actually very drought tolerant in shade, especially if you top dress with compost. 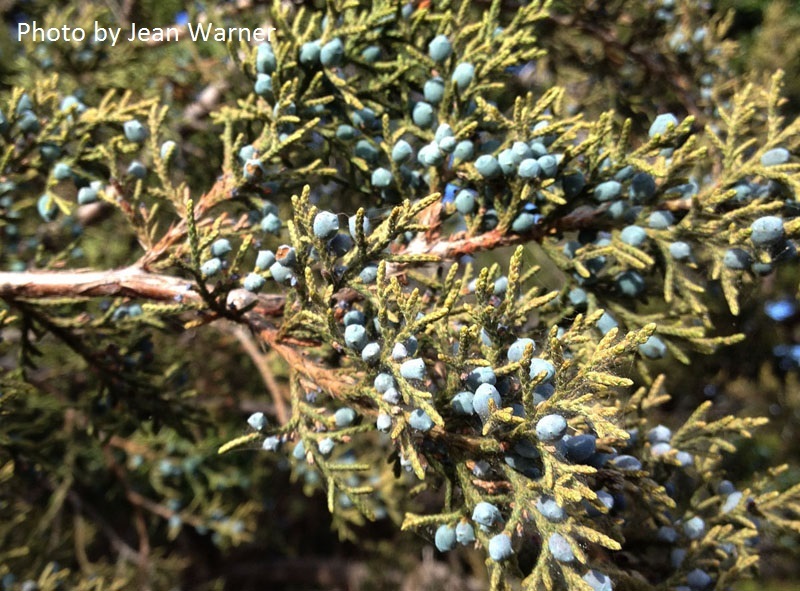 Daphne’s Question goes to Jean Warner, whose ashe junipers (cedar trees) are in decline. What’s up? Spider mites. 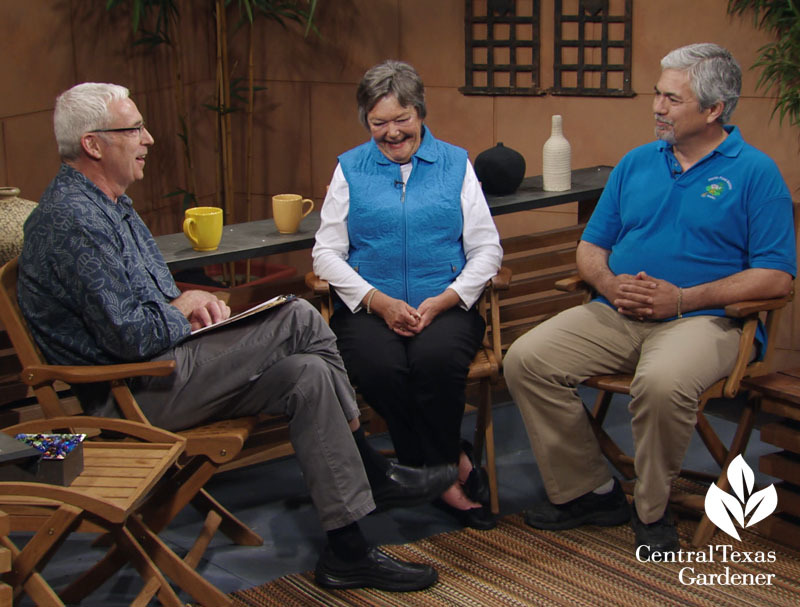 Daphne explains why spider mites can move in on drought-stressed plants like cedar trees, even when it’s not hot, dusty weather. Perhaps our heavy rains rinsed them off Jean’s plants, though we can fend off this pest with frequent blasts of water underneath the leaves. 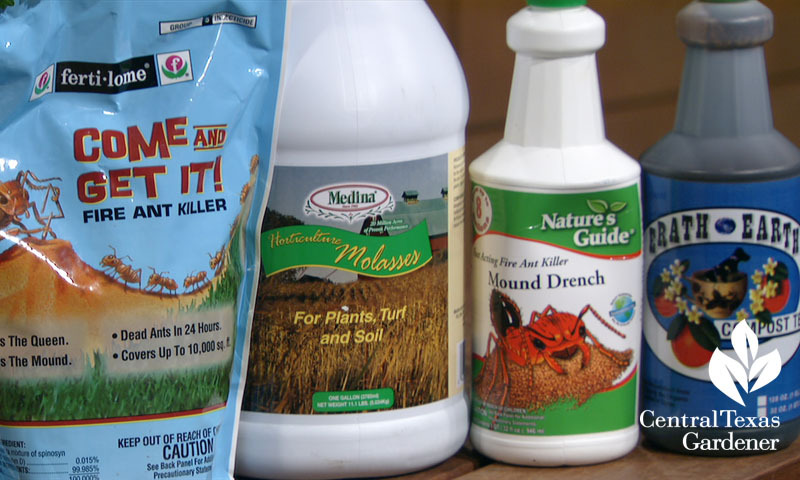 Ants in our plants (containers) is one of our top questions. 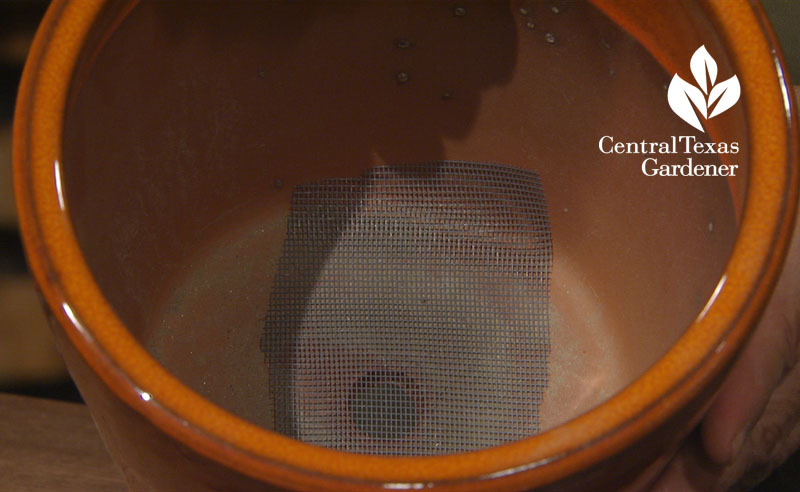 John Dromgoole takes on this one with a simple tip: a screen mesh at the bottom of your pot. If ants are already in, he shows how to tackle them safely. Also good to battle fire ants in the beds. 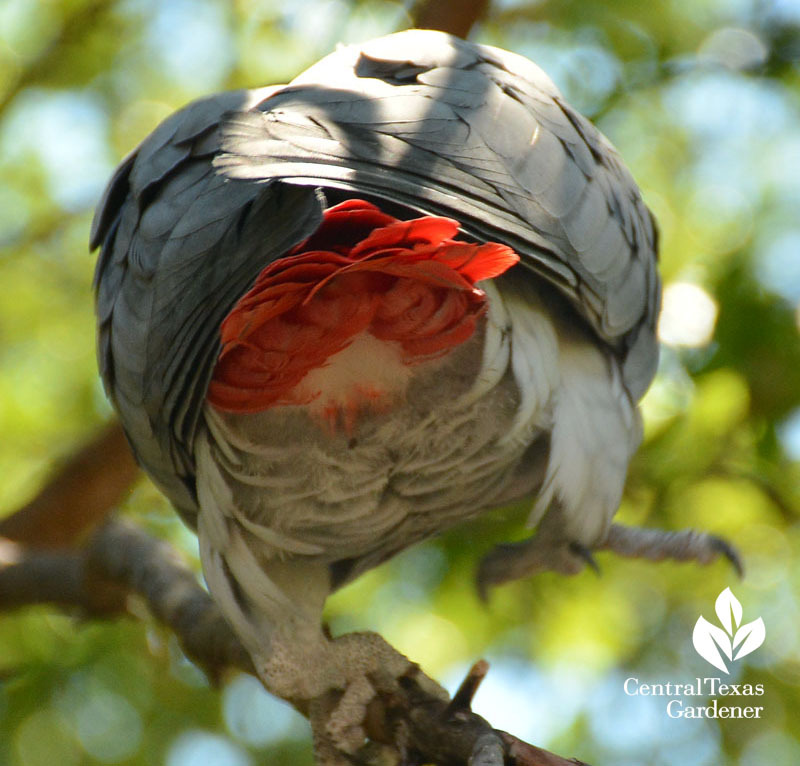 Picture of the Week goes to Lee Franzel, our very helpful friend and Comal County Master Gardener. 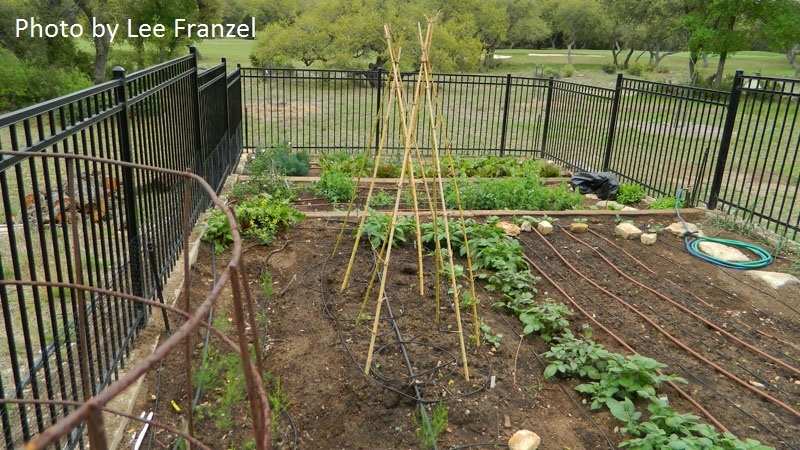 In deer and rabbit country, he constructed a safe home for his vegetables. Cattle panel on T-posts supports cucumbers, but could be used for tomatoes. 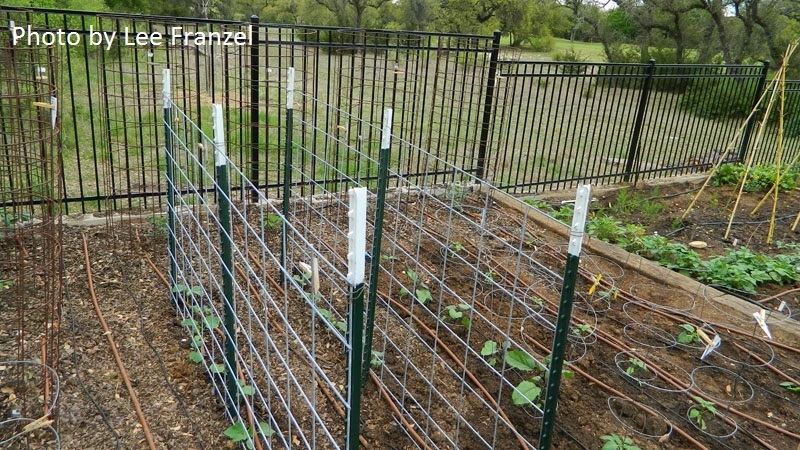 Tie up bamboo stakes for climbing vegetables like beans, squash, and cucumbers. 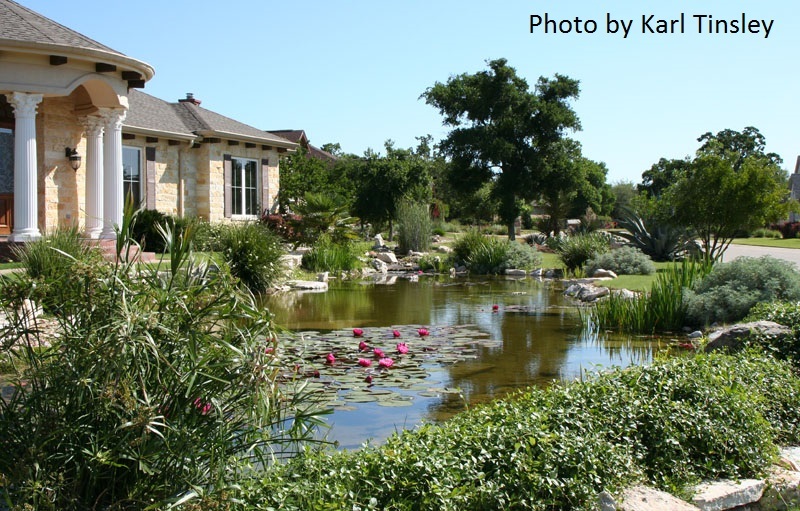 Our spotlight is on the Austin Pond Society tour, coming your way June 7 & 8. Tom joins Linda and Karl Tinsley to show off just a couple on their 20th anniversary tour. We actually taped one of the first, back when personal ponds were “What? !” I remember that I was in awe. 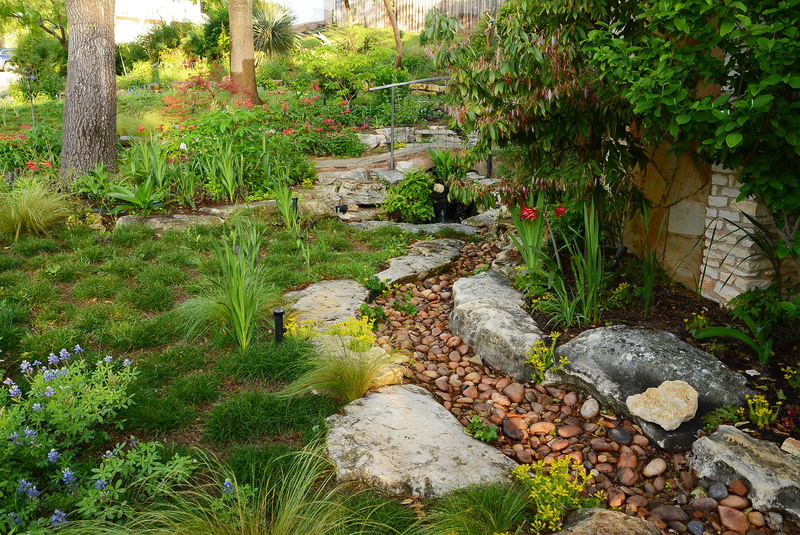 APS has helped SO MANY people get started ponding–big, small, fountains, streams. As always, their proceeds benefit local organizations. 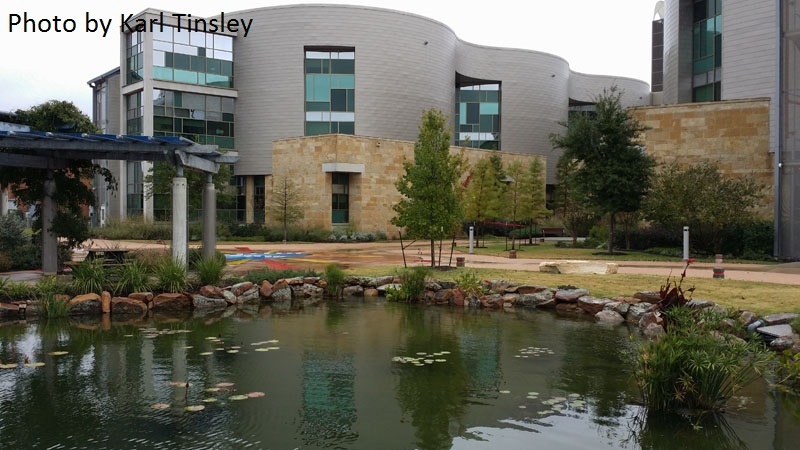 This year, it’s the Dell Children’s Medical Center where you can visit on Sunday, June 8 from 9 a.m. – noon. Visit south ponds on Saturday—including night gardens—and north ones on Sunday. 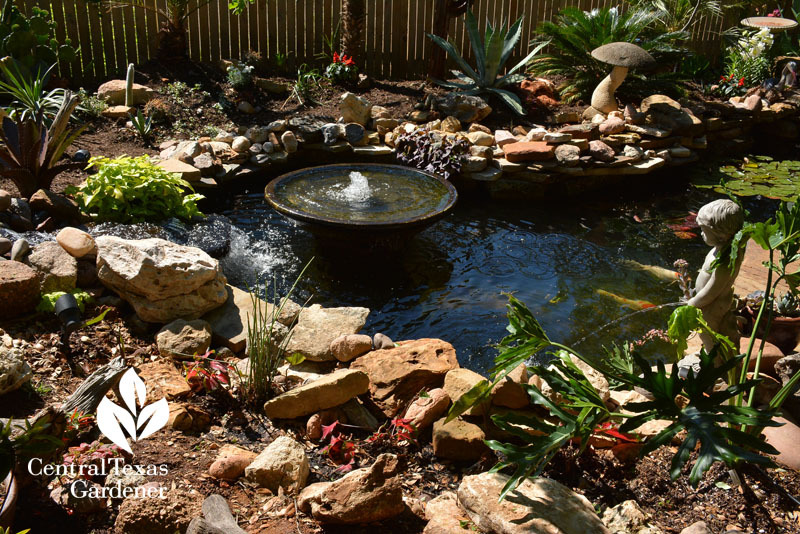 If you’re thinking about a pond or want to improve yours, helpful owners are glad to share everything they know. You’ll also see designs of all kinds to make your own match. Here’s how to get the map and tickets. 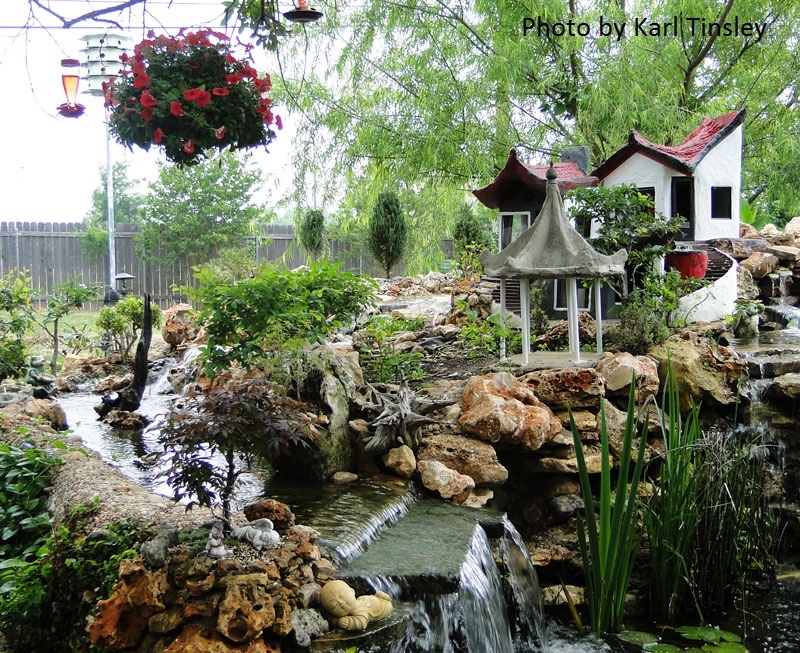 One we preview sprinkles magical home-made fairy gardens throughout, including a tiny fairy garden pond. 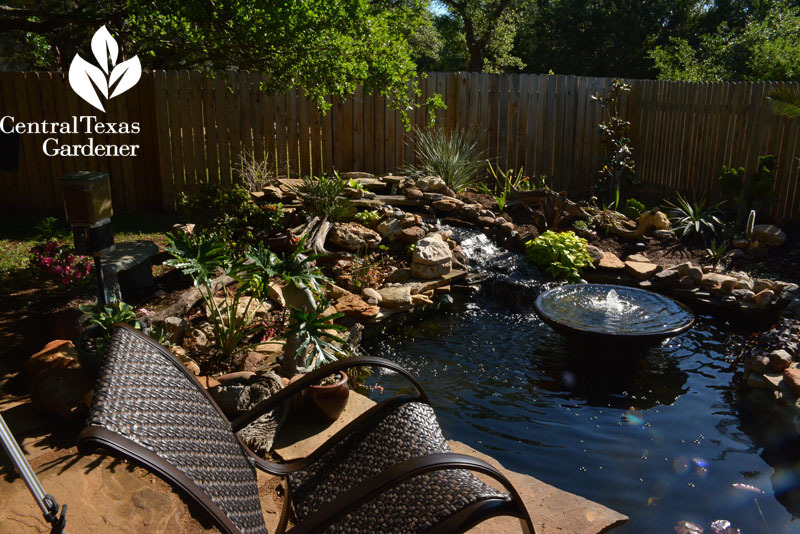 Wow, wouldn’t it be great to have this pond in your front yard? They carry it on in back, too, with a stream that connects with the neighbor’s pond. 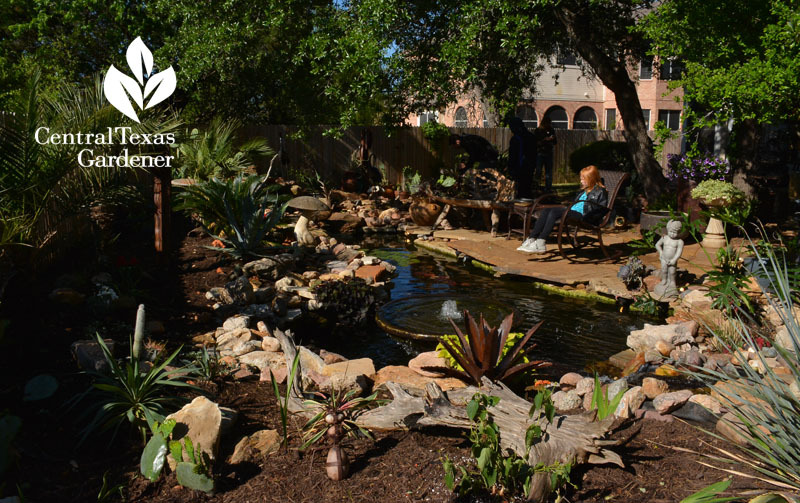 On our video tour, get a closer look at Laura and Travis McGarraugh’s backyard, where they built two ponds to replace grass when their children Daniel and Naomi outgrew the playscape. Laura’s always wanted ponds and fish. 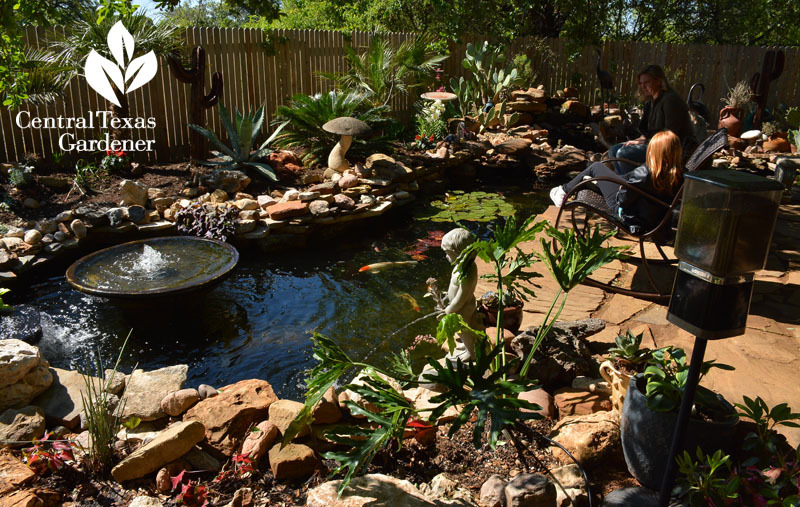 As an emergency room nurse, their “Tranquility” and “Pilfered Rock” ponds help her unwind after 12 hours on the job. And hey, they’re honest enough to share their mistakes, too! You’ll often spot daughter Naomi out there with a book or feeding the fish they’ve named. 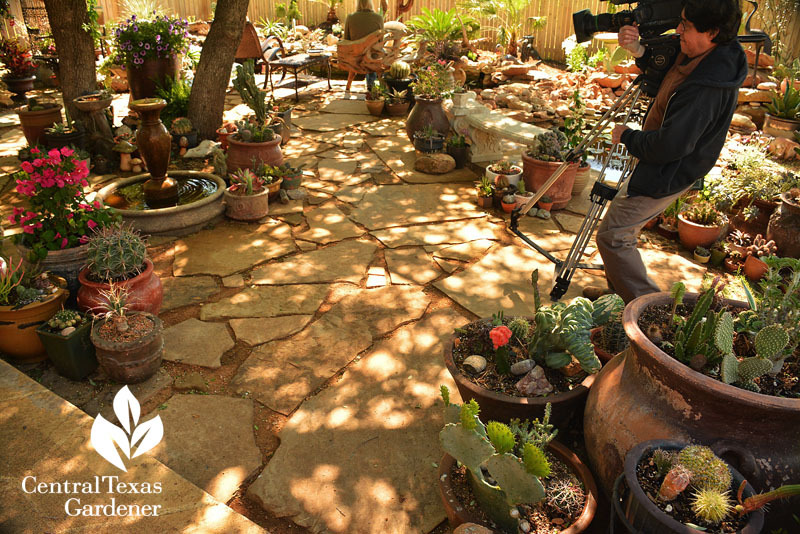 Travis built the ponds and laid the Oklahoma Hickory flagstones for their outdoor living room. 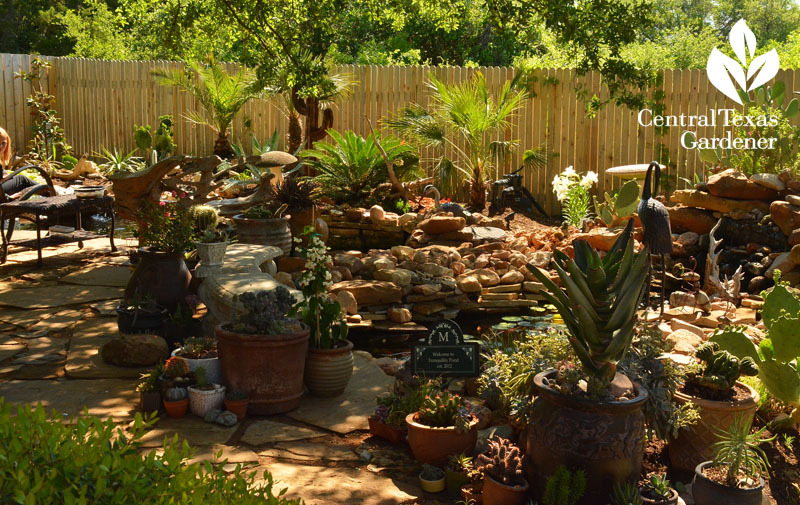 He chose crushed granite as infill to filter rainfall to their trees. Here’s director Ed Fuentes moving in for a shot. Laura and Naomi often spend after-school time designing containers together. 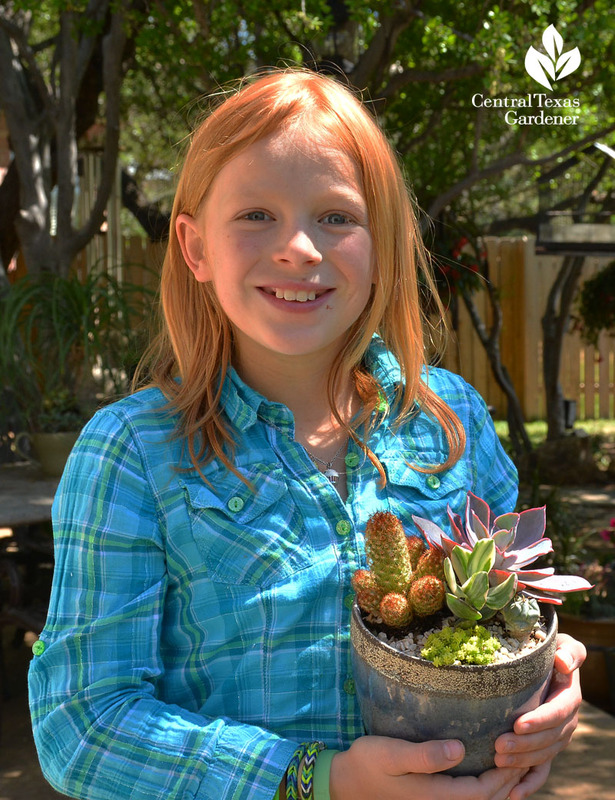 Naomi’s got a great eye for succulents! 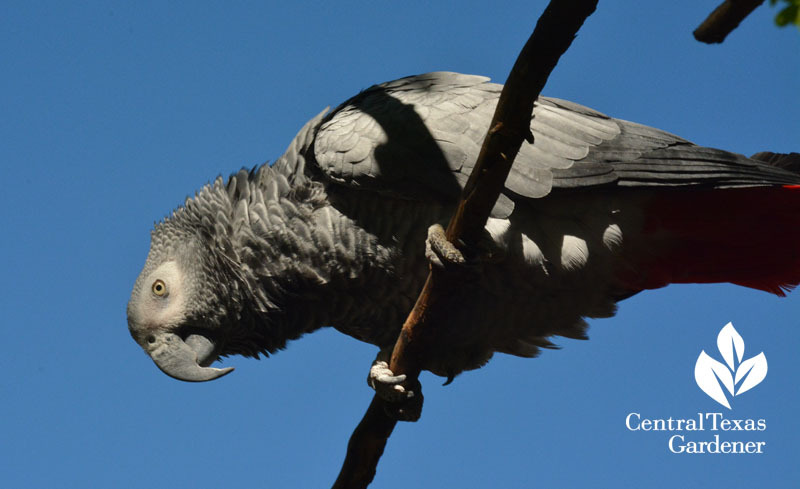 I don’t know if African Gray parrot Taz will come outside for the tour, but she’s so cute I had to introduce you. She really directed this taping. She’s not giving us a bird’s version of “the bird” here. On cue, she turns around for a bath and I used the magic words! ← Wild Wonders + Meet the Beetles!